Assets from future Disney movies will be hidden on the initial game disc. Judging by how vociferously the internet responds to it, it's fair to say that on-disc DLC is an unpopular practice among gamers. 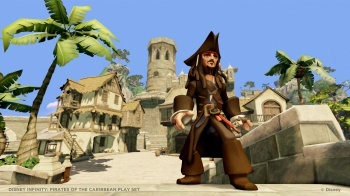 Disney, however, will take its chances with its upcoming title Disney Infinity. The Skylanders-esque game will contain unlockable content right on the disc, but here's the twist: It all comes from future Disney projects, and revealing it at the time of shipping would spoil the surprise. John Vignocchi, the game's executive producer, warns that if tech-savvy buyers hack Disney Infinity discs, they could find content that shouldn't see the light of day for up to twelve months. "We're hoping that isn't something that is widespread reported because then people are going to start looking for it, and it's going to ruin the magic for the consumer," he says. At present, Vignocchi plans for yearly hard-copy Disney Infinity releases, with each disc containing relevant data for the following year of content. The most obvious response to Vignocchi's plea is that Disney Infinity should have had all DLC available for download instead of hiding it on the disc. Vignocchi sees the logic in that idea, but argues that it isn't feasible just yet, especially since the product's young audience may not have constant broadband access. "In the future, as we move on to new versions of consoles we're going to be able to digitally deliver that content, and the figurines themselves will simply be dongles that allow us to then instantiate a download of that content," Vignocchi explains. ""But given the current generation of consoles, the content needs to be on the disc." One has to wonder why Vignocchi would share this information with the internet if he didn't want it to be widely reported, but perhaps he's banking on the inherent good feelings many people associate with Disney products. How about this: If you're going to hack the Disney Infinity disc and leak all of the upcoming IP details, could you at least use spoiler tags?